Here is another list of 50 weather related words to complement science curriculum related to the environment, global warming and weather. 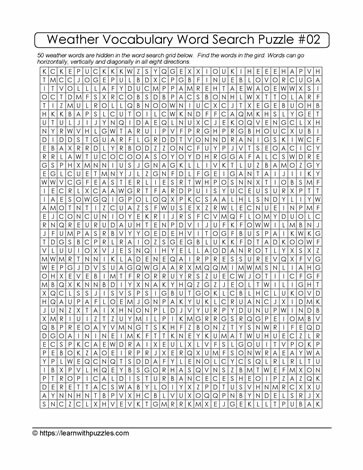 To solve this word search puzzle, find the list of 50 words in the grid. The list of words is on the second page. This puzzle also supports fine motor skill practice since students need to work within the grid to locate the words and then draw lines through the words once they are found. This puzzle is also suitable for grandparents who want to engage their brains in solving word searches that stretch their minds.